This is my setup in FTB to automatically pump lava out of the nether. It's fairly simple. It relies on Mystcraft, Buildcraft, Railcraft, and a bit of Thermal Expansion. All standard mods in FTB. The use of gates and pipe wire might be new to a few people, but it's all standard buildcraft. I've dumbed down the descriptions a little for people unfamiliar with how BC gates and wire work, but people who know what they're doing can just look at the screenshots and figure it out. This setup is fully automated, and requires no energy to run. It also tries to reduce lag by only running engines and pumps when there is actual work to do. The only cost involved is the price of the materials.. and making the gates isn't exactly quick or cheap, requiring an assembly table and lasers which use a not-insignificant amount of power. Please pardon the ugly walls and unfinished flooring. This whole setup is buried below my base, out of sight... and the nether half is also buried and cobbled-in to protect it from ghasts. So, we start in the nether. A standard Buildcraft Pump hovers precariously over a large lava lake. Out the top are golden waterproof pipes that lead to a magmatic engine and a storage tank. The magmatic engine is from Thermal Expansion. 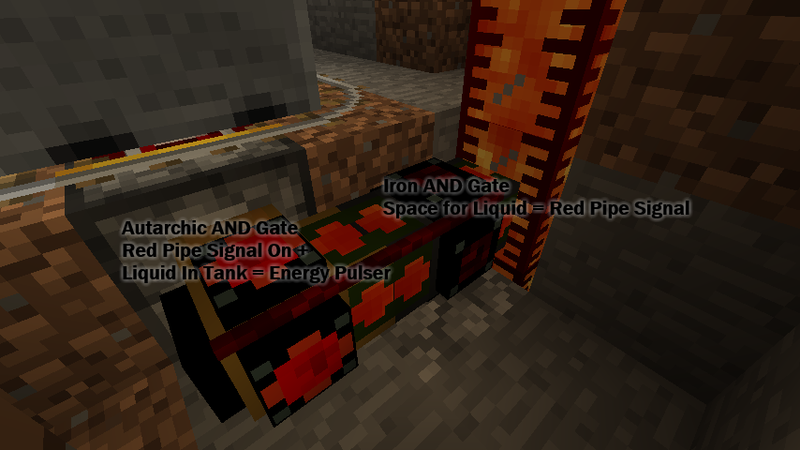 There is red pipe wire connecting the two buildcraft Iron AND Gates. The gates are set as indicated. This means the engine only runs when the pump has lava to pump and the tank has room for more lava. This prevents the engine from overheating (magmatic engines don't explode when they overheat, they just shutdown until they're fully cooled. So annoying, not catastrophic). This also reduces lag since the pump won't be operating until there is somewhere for the lava to go. You can see in the screenshot that the pump has work (red pipe wire is on), but the tank is full so the engine isn't running. We have a wooden waterproof pipe coming out the side of the tank, with an Autarchic Iron AND Gate set as indicated. The red pipe signal comes from another gate you can see in the picture below. Energy Pulser is unique for Autarchic gates.. basically they act as fast redstone engines when emitting the Energy Pulser signal. So when the red signal is on, and there is lava in the tank, the Autarchic gate will pump the lava out of the tank. So not only are they faster, but since the gates are actually *in* the pipes, they save space. Now we see the other Iron AND Gate, set as indicated. There is again, red pipe wire running between the two gates. This is a very common setup. If there's space in the destination (liquid loader), and liquid in the source (lava storage tank), then the autarchic gate will pump the lava from the source to the destination. The autarchic gate won't "run" unless these two things are true, so, again, we reduce lag while idling. 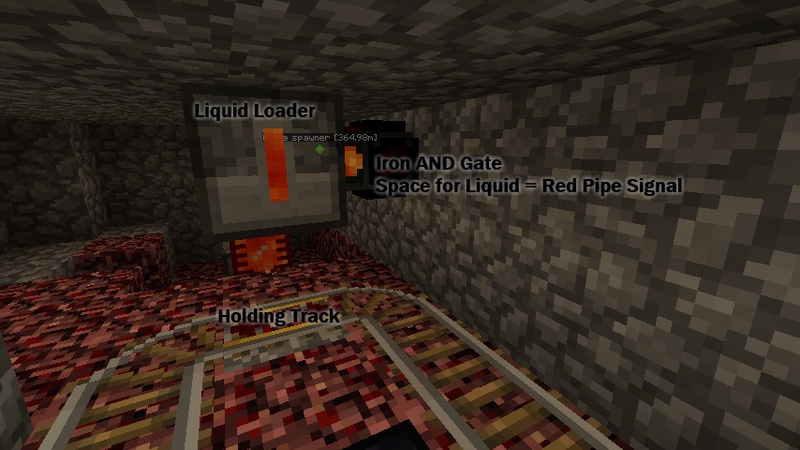 The Liquid Loader is from railcraft, along with the Holding Track below it. Basically the Liquid Loader will pump liquids into special "Tank Carts". The holding track will stop the cart directly below the liquid loader, then the liquid loader will automatically pump lava into the cart. 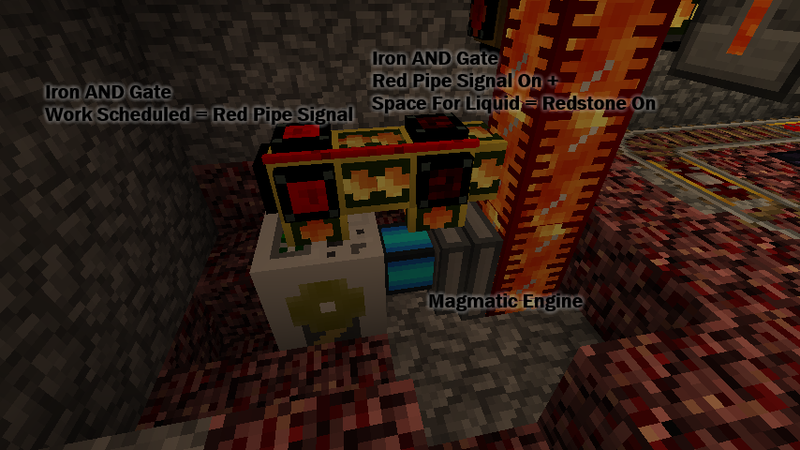 When the cart is full it will emit a redstone signal that tells the holding track to release the cart. The cart will then continue the direction it was going, at the speed it was going before the holding track stopped it. Here's the track layout. I've set up the mystcraft portals so that the portal from the overworld transports the cart directly onto the Boarding Track. I haven't used any link modifiers on the mystcraft books, so when a cart goes through a portal, it arrives with no momentum. The boarding track is similar to powered rail, except that it's uni-directional and can boost a stopped cart. So as soon as the cart comes through the portal and lands on the boarding track, it is then sent down the track toward the liquid loader. The holding track will then send the cart on its way, through a mystcraft portal that leads to the overworld. I also have a world anchor in the floor to keep all these chunks loaded so it will all continue to function even if I'm far away. Now to the overworld! You can see the track setup is almost identical to the nether side. 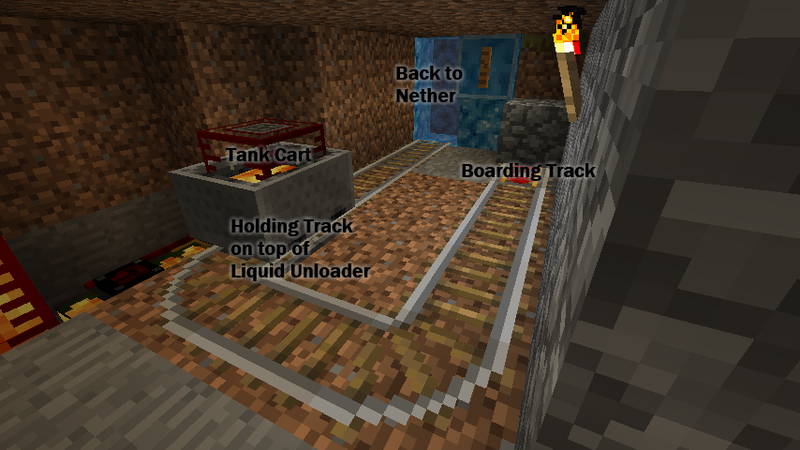 The nether portal leads directly to the boarding track, which sends the tank cart to the holding track which is on top of a Liquid Unloader. The liquid unloader does the opposite of the liquid loader, of course. It drains the cart and stores the liquid in its internal reservoir. When the cart is empty, the liquid unloader tells the holding track to send the cart on its way. 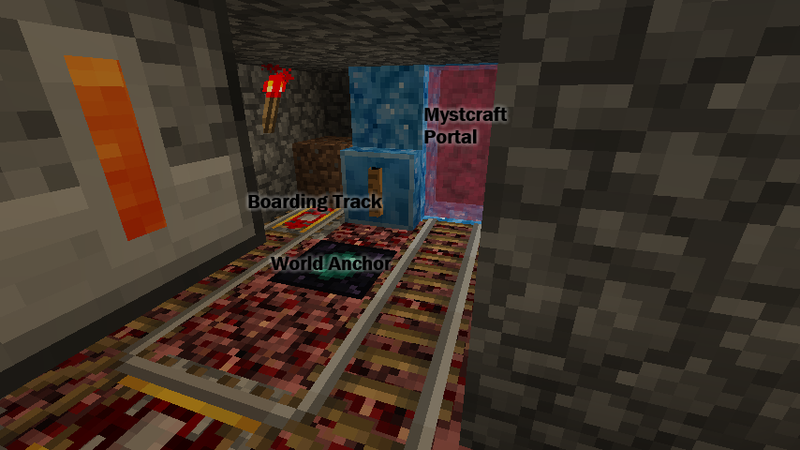 The mystcraft portal of course leads back to the boarding track in the nether. Here's the hookups for the liquid unloader. We've got a wooden pipe coming out of the unloader and heading over to another storage tank. Our standard autarchic gate setup makes sure to only pulse when there is liquid in the liquid unloader and space for that liquid in the tank. That's pretty much the entire system. 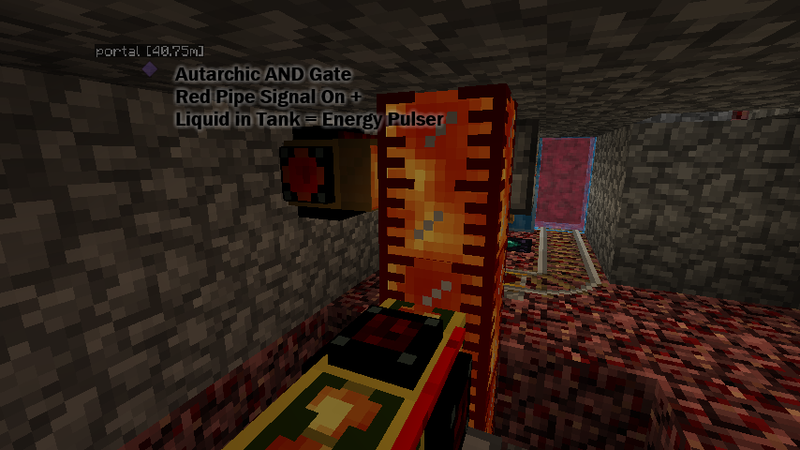 I have a similar gate setup hooked up to the overworld storage tank that automatically pipes lava out of the tank and into a few geothermal generators that are connected to an MFSU. You'll need to put a bucket of lava in the magmatic engine to kickstart it, but after that, the system will keep it topped off. You'll find that the cart will spend most of its time idling above the liquid unloader, waiting until there is room to unload. Then it will travel to the nether, pick up more lava and return. Depending on how quickly you use the lava, you'll find the entire system idles 99% of the time. If the lava lake ever runs out, I only have to move the nether part of the system, I can create a new linking book for its new destination and swap the book out on the overworld portal.